Ok, this is definitely not a cool-climate wine, any of you who have been to Southern Oregon during the growing season will know that it gets damn hot there. But on a recent trip to Abacela in Roseburg, I couldn’t help buying a bottle of this Syrah. It just tastes so varietally correct to me. It’s got some of those true Syrah aromas of gravel and plum, along with a very faint vegetal character. There’s very little oak on this version of Abacela’s Syrah, which unfortunately is more than I could say for its higher-priced Reserve Syrah. On the palate it’s bright with a nice fresh acidity and a finish that’s not too tannic or grating. It’s just a pretty-drinking wine that’s balanced and fresh and stays true to the varietal. Abacela has become known for their Spanish varietals and they make a great Albariño and Tempranillo, and most recently a pretty spectacular Grenache. Their new tasting room is actually a gorgeous spot in the middle of an area that’s mostly a suburban wasteland of Southern Oregon. I’ve written about Cristom before for this humble electronic publication and I’ve really enjoyed their wines. Cristom is an outstanding Pinot Noir producer on the Southern edge of the Willamette Valley. Unlike most Willamette Valley wineries, it hasn’t put all its eggs into the Pinot basket and it has a small amount of outstanding Syrah. This wine had the kind of complex nose that screams cool-climate: olive paste, savory, under-ripe strawberry, and a slight hint of bubble gum, celery salt, kind of a kirsch element, and licorice, with an underlying minerality that’s a tad surprising for a wine with 14.5% alcohol. Again, just like the ’05 I tried from Cristom this is another textbook example of authentic Syrah. It’s not over-oaked or manipulated and there’s just a purity of fruit that belies the cool-climate location of the vineyard. There’s a ton of potential in Oregon for Syrah and I hope to explore more examples of the variety from it’s vast and diverse appellations. You may or may not have heard of Ram’s Gate but you can’t have missed it if you drive to Sonoma with any regularity. Since my parents live there, I’ve often driven by so I’ve seen it morph into its current modern-style winery extravaganza. It used to be the little-visited Roche Vineyards characterized (at least for me) by a sad patch of vineyard in a low, puddle-prone area right by the road that would, even after a slight rainfall, effectively drown the vines. Ram’s Gate was quite a transformation, as the old Roche barn was taken down and replaced with a rustic-modern building that is more wine bar than tasting room. I wish I’d taken pictures but you can get the idea here on their website. It’s a pretty cool idea, and all the wines are Ram’s Gate wines. You order them by the glass, with or without small plates of food, find a place to sit inside or outside, and look at the great views, which are all around. On our visit, we were greeted by a concierge at the door who ushered us over to the wine bar. 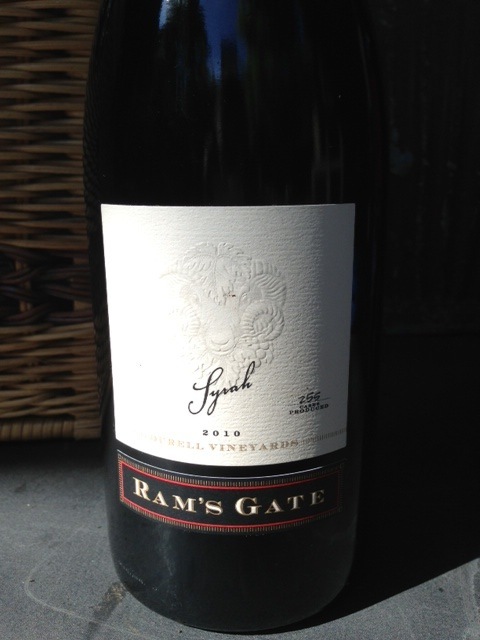 I hadn’t heard much about Ram’s Gate’s wine so I was excited to see that there was a cool-climate Syrah for sale. Even though it was 90 degrees out and I was thinking of something more in the white or rosé category, I went for it. I was more than pleasantly surprised. The wine was definitely pushing into the warm climate range with its low tannin and acidity but it had a lot of cool-climate characteristics. On the nose, I got peppercorn, cured meat, violets, blackberry and even an unmistakable aroma of Olvatine in powdered form, not yet added to milk or water (I know, somebody stop me). This was a wine that again confirmed my growing suspicion that Carneros is really becoming a sweet spot for Syrah. This wine had the perfect combination of both warm and cool-climate characteristics and there’s no doubt in my mind that it would please many wine-drinkers who are on both the warm and cool sides of the fence. 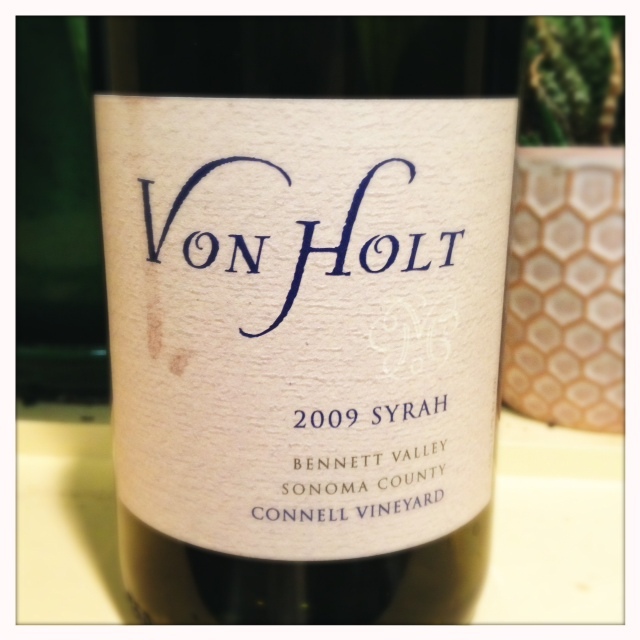 I’ve written about Von Holt before and just to give a quick reminder, they are a husband and wife team who live in San Carlos and along with their winemaker John Fones make cool-climate style wines from Northern California. I was intrigued by this Bennett Valley Syrah as I’ve had some spectacular Syrahs from there recently. First, this wine has a bit of oak that comes off on the nose. It blows off a bit after a while which actually surprised me because it seems like oak almost never dissipates. A little time open on the counter did wonders for allowing the character of this wine to show up — and show off. The most present aroma I got right off the bat is not something that one normally gets on California Syrah and for some might be a turn off: aromas of celery and pepper. Yes, not exactly a home run for most California wine drinkers but for me, those aromas have a direct connection to the Northern Rhone wines that I love. There’s also some dark cherry aromas. On the palate this wine is not too rich with a good amount of acid, and on the finish there’s a nice bite of tannin and acidity. This is good stuff and worth seeking out.